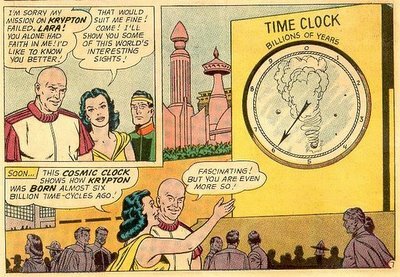 Okay, day before the trial we spin the wheel of fortune and whoever gets picked defends the evil criminal Superman for murdering the wonderful Luthor. 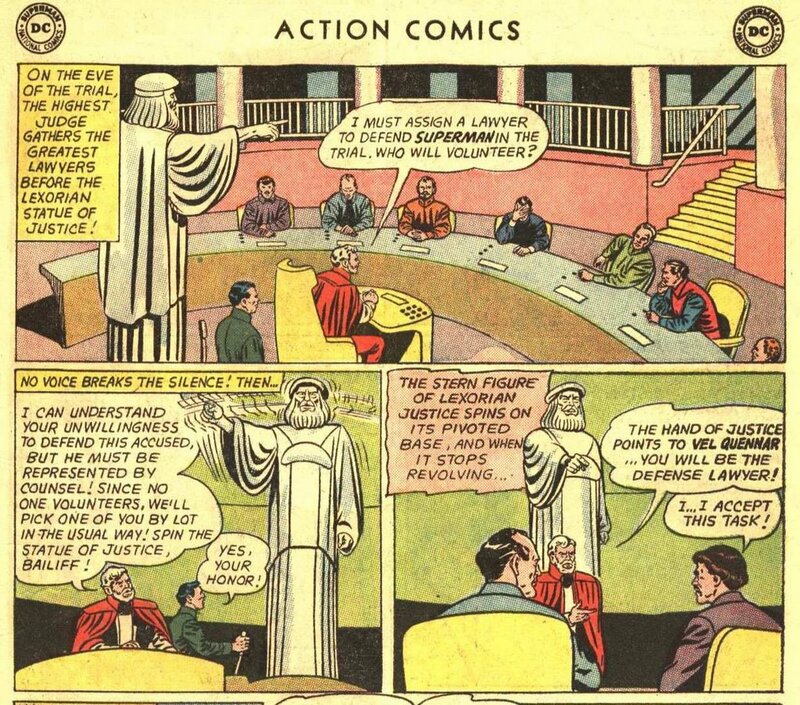 Lexor is not Krypton, but this is creepy DC scientofascism nevertheless. 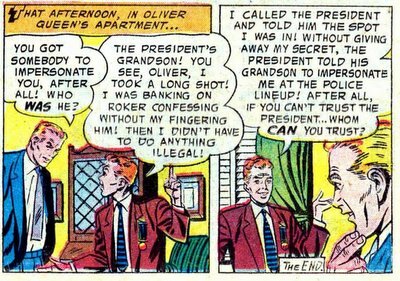 This was something DC got into in the late 1950s and early 1960s, whereby some inanimate object or other would tell "its story". 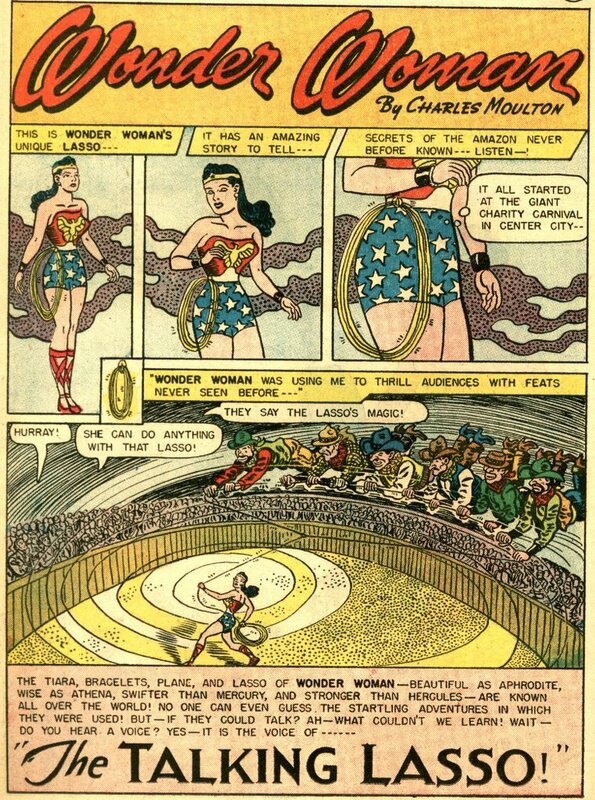 Here are just two examples from Wonder Woman #86 and #88 (1957). These are not even the worst examples; far more execrable was a series called "Tales of Kryptonite", where a chunk of that metal would narrate a story complete with pleas for Superman to stay away before he gets hurt. Extreme silliness. 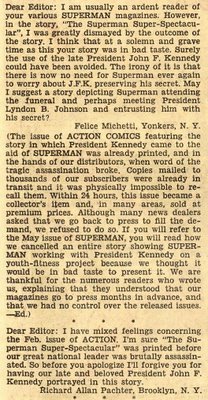 Fred Hembeck writes on the 1961 price increase in comics from 10 cents to 12 cents. 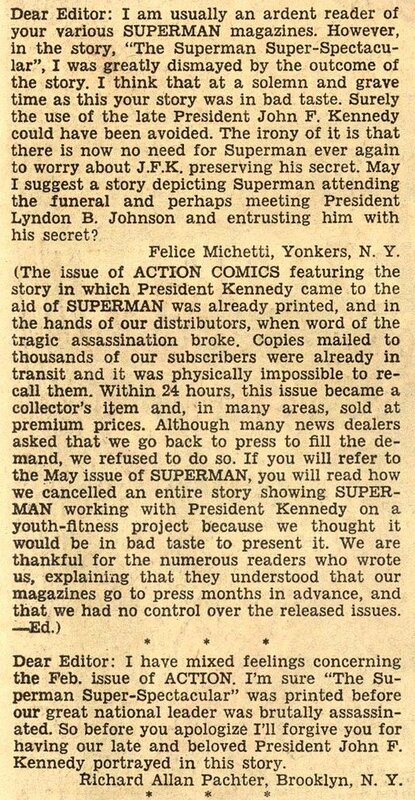 I'm only a couple years younger than Fred, but I got into comics fairly late (age 13) and so my big case of sticker shock came in 1968, when comics went from 12 cents to 15 cents. My allowance back then was only 60 cents and as I was in between my paper boy years and my lawnmowing years, the realization that my comics budget had been sliced from five books to four was quite annoying. The Silver Age actually was a time of pretty good stability for comics prices and the value you received for your money. When you consider that at the beginning of the Golden Age comics were 64 pages plus covers for a dime and by the end they were 32 pages plus covers for that same dime, it's not hard to see that prices effectively doubled. During the Silver Age, comics stayed remarkably the same in size and the price only increased by 50%. Of course, there were subtle ways that the publishers sometimes reduced the value. 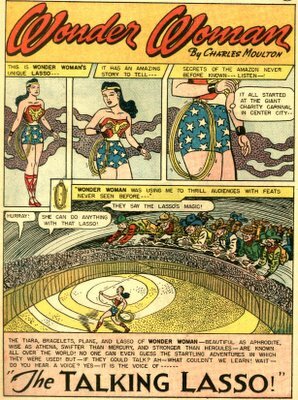 For example DC comics generally had 24-26 pages of story and art inside the magazine at the beginning of the Silver Age, and only 22-23 pages when it was over. 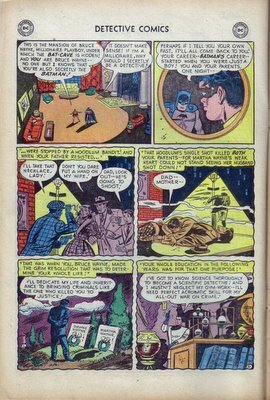 Marvel early in the 1960s was fairly comparable but by 1964 or so they were pretty much down to 20 pages; IIRC before the end of the decade they would sneakily be making 19 pages look like 20 by putting half story/half ad pages in the centerfold. Of course, this was nothing compared to what would happen before the 1970s were through. Story page counts would continue to drop, and prices would skyrocket. Batman #219, the first non-giant of the 1970s in that title, was 15 cents. Batman #318, the last issue of the decade, was 40 cents. Unfortunately prices had not nearly stopped rising. One of my favorite issues of the Silver Age, it featured a team-up of Hal Jordan, the Silver Age GL and his Golden Age counterpart, Alan Ladd (Correction per comment by redmans: the GA GL was Alan Scott. Supposedly the character was going to be named Alan Ladd to evoke Alladin, but the movie star came along and DC renamed the character). Also featured prominently is Doiby Dickles, the GA GL sidekick, and his taxi, Gertrude. In the story, Doiby encounters the lovely Princess Ramia. She is fleeing the evil Prince Peril, who is determined to marry her unless she can find another husband within a short period of time. Doiby recommends first Alan and the Hal to the Princess, but predictably she marries Doiby himself. DC tried many of these bits and I can't think of a single one that brought anything to the plot. Your Favorite Silver Age Covers? Don't Let Dr Wertham See This! Uh, "arms"? He's only got one, remember? 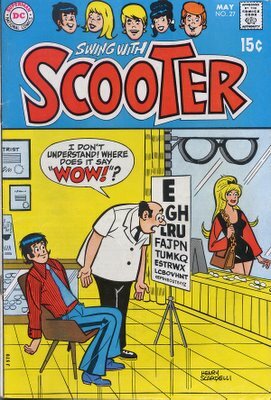 Scooter was DC's attempt to cash in on the teen humor success of Archie, and Beatlemania. He was a British lad with a Vespa (hence Scooter), imported to America. 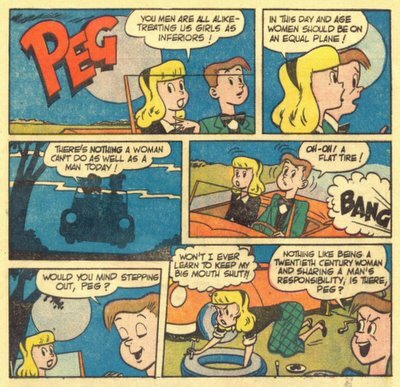 Like Archie he had two gorgeous girlfriends fighting over him, a blonde (Cookie) and a brunette (Penny). 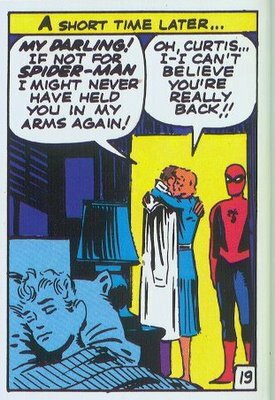 He was supposed to have a nemesis named Malibu, but by this issue it looks like they were friends. 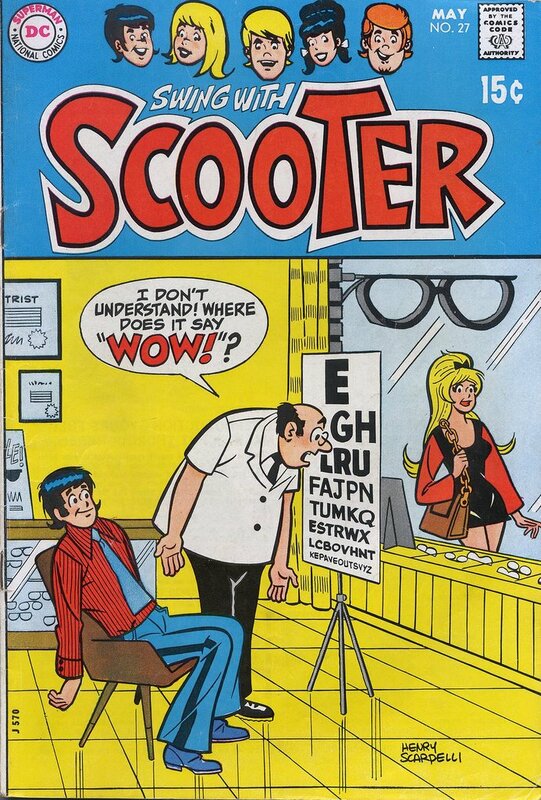 GCD says that the stories in Scooter #1 were supposed to appear in a Showcase issue, and it was even advertised as such, but DC decided to go ahead and give Scooter his own title on the basis of the Beatles phenomenon. 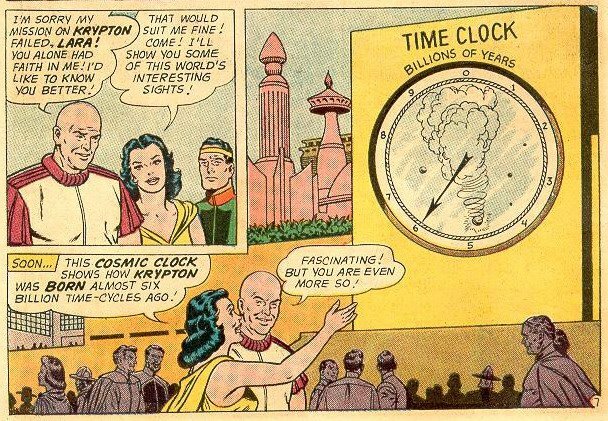 Um, that's quite a clock; each hour represents a billion years? And there are no smaller hands? If we accept that the clock is broken down into tenths or so, that still means 100 million years between each tick. In other words, there is no sense building any kind of mechanism to count the time; the clock might as well be a painted hand on a cave wall. 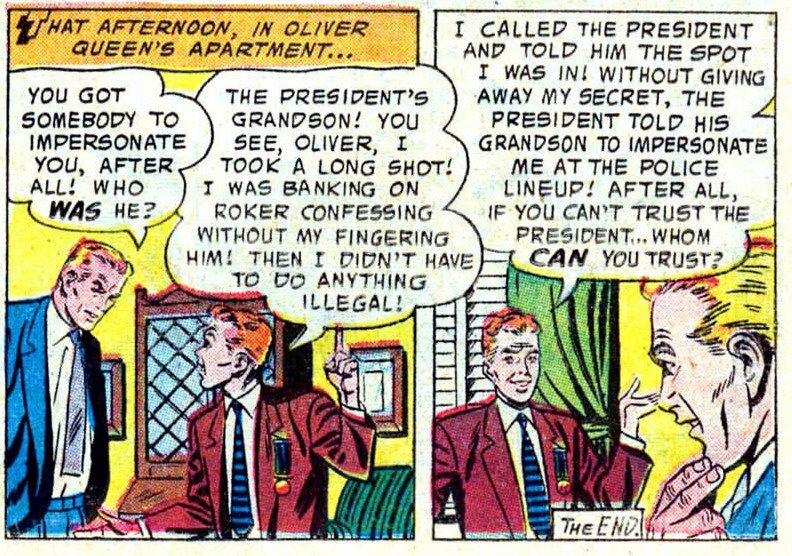 I had always remembered this particular story as imaginary, but reading it now, I realize that the only "imaginary" sequences are when Luthor fantasizes about his future as Superman's father. Luthor came within a moment or two of marrying Lara, but once he was gone, she quickly fell into the arms of Jor-El. Pretty lousy characterization! 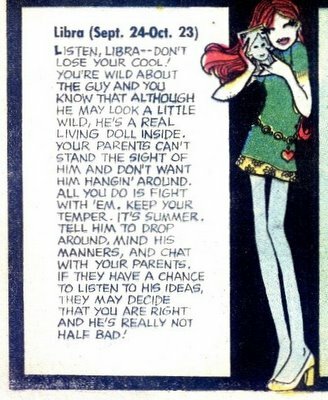 Today, for obvious reasons, I thought I'd talk a little bit about romance comics of the Silver Age. Now romance comics don't get a lot of respect among comic collectors, but they represented a significant amount of comics in the Silver Age. 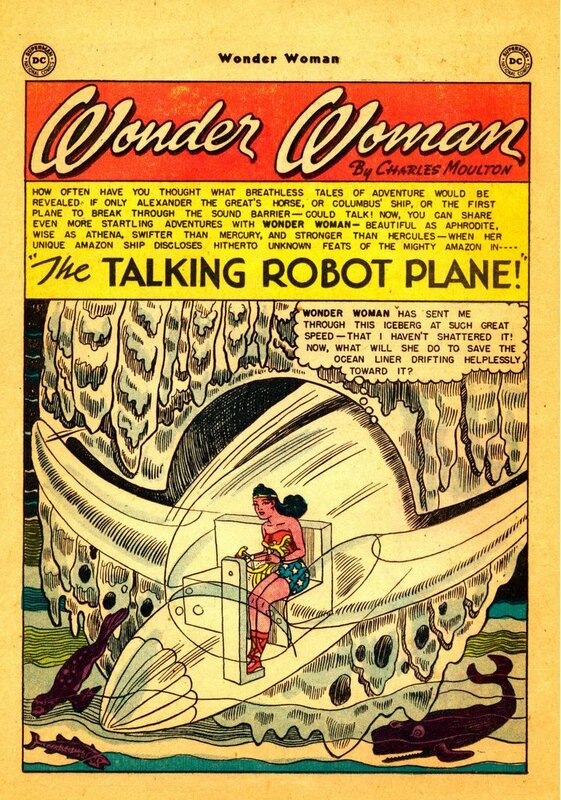 For example, DC published 243 romance comics in the 1950s and upped that considerably to 460 comics in the 1960s; approximately 1 in eight books DC published that decade were romances, significantly more than their adventure and science fiction books combined. The romance comics represented a pretty good bargain for girls. While DC's superhero titles generally featured about 25 pages of story and art and maybe 5 pages of ads (ignoring covers), their romance mags often carried no advertising other than house ads and so could have 30-32 pages of story and art, depending on whether the mag contained an advice column. The romance comics often featured relatively mature fare. 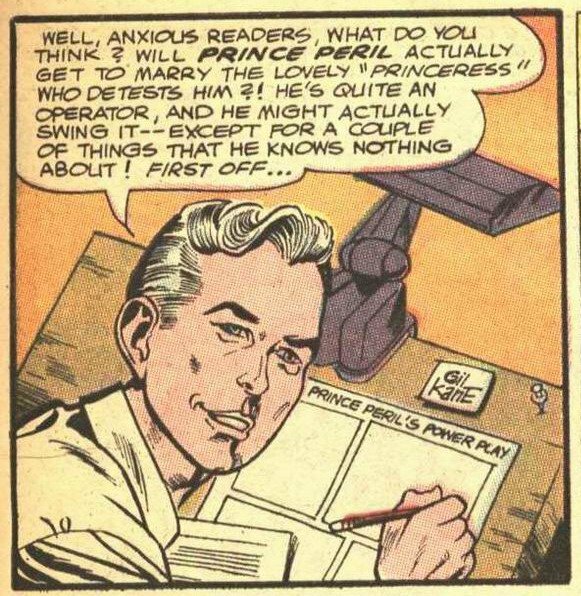 Part of this may have been that romance comics were read by older readers than the superheros. 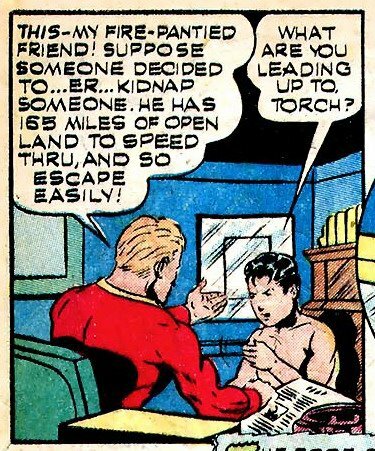 Like many other comics genres, romances were often grippingly realistic in the early 1950s, then changed to more bland fare in the latter part of that decade with the onset of the comics code. 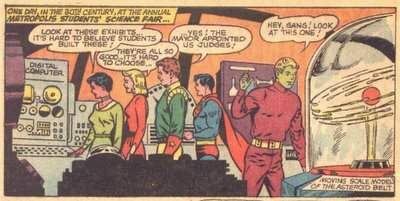 Maybe It Was the 30th Century "Special" Science Fair? Check out that ultra modern digital computer. Adventure #244 (Jan 1958) is not a famous issue, but it does have some historical significance. One of the backup features in Adventure at the time was Green Arrow, and the story in that issue was “A Medal for Roy”. It’s kind of a puzzle story; how can Green Arrow and Speedy overcome an obstacle? Speedy is chased by some crooks into Oliver Queen’s apartment. Quickly changing into Roy Harper, he diverts and then subdues them. 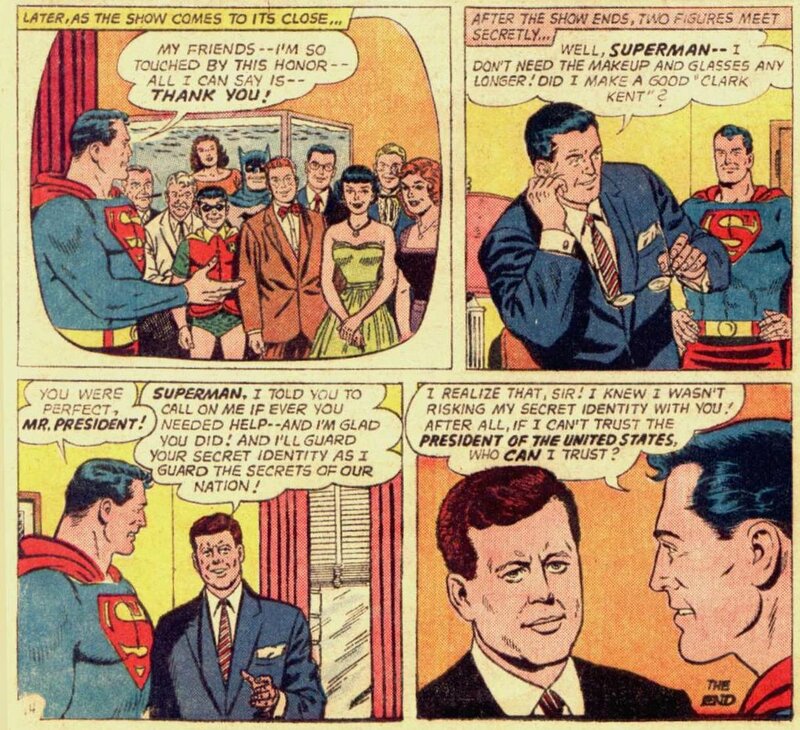 Because he had “rescued” Speedy from those crooks, the President (Eisenhower at the time) wanted to bestow a medal on him. Unfortunately Roy also has to be present as Speedy at the same time for a police lineup. How can he possibly skip either event? Cute little idea for a story, and six years later DC decided to dust off the plot for another story, with disastrous results. Update: Note that Roy gets it grammatically correct, while Superman errs; it's "Whom can you trust?" As an aside to make this story even a little more bizarre, back around 1970 my parents went down to Mexico for a business trip. When they returned they brought us kids small gifts; mine were two Mexican comic books. One was labeled SuperComic, and apparently consisted of reprints of older DC comics. 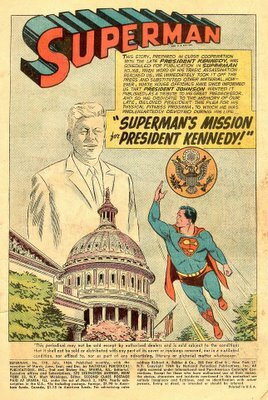 As it happened, this particular issue reprinted Action #309, which gave me quite a start, as they had not redrawn the face of the president. I couldn't help but ponder the thought of Mexican kids coming to those last few panels, seven years after the events in Dallas and what they must have thought. Caramba! 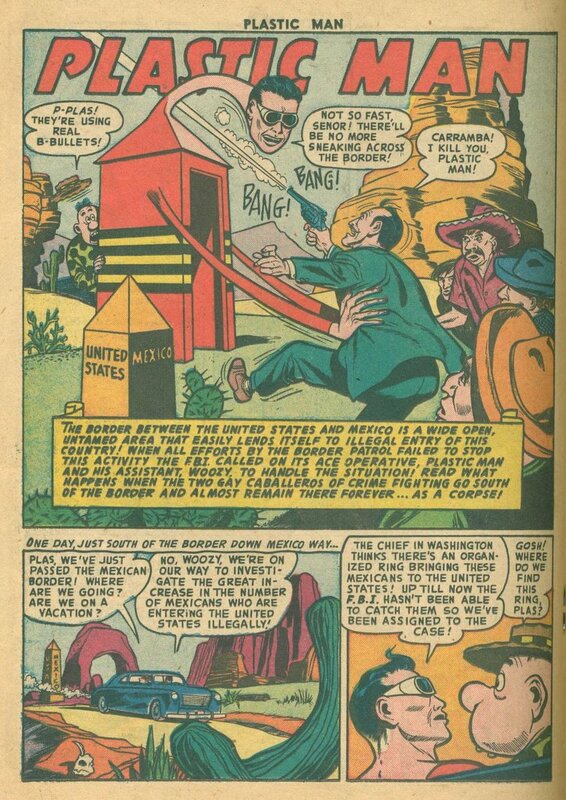 Of all the Silver Age characters, Herbie Popnecker is undoubtedly one of the most unusual. The 1960s, when Herbie became a surprise hit, were all about cool, with James Bond and Joe Namath setting the style. Herbie was the anti-cool; homely, fat, and none too athletic (apparently). His long-suffering father despaired that Herbie would ever be a useful member of society; as he put it, his son was a "little, fat nothing!" 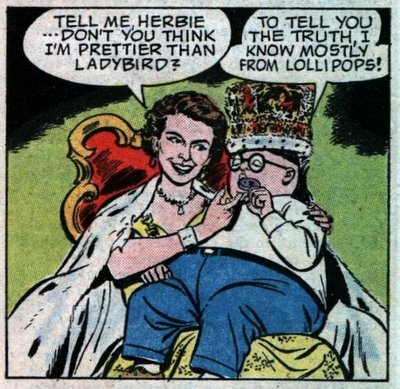 But what Mr Popnecker didn't know was that Herbie was secretly one of the most famous young men in the world, a confidant of Lyndon Johnson and Nikita Kruschev (and adored by Ladybird Johnson as well). Herbie's secret weapon was his apparently infinite assortment of lollipops, which contained amazing powers. 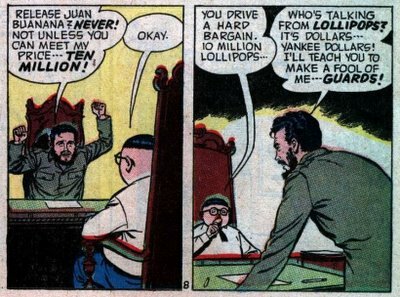 There were time travel lollipops, anti-gravity lollipops, invisibility lollipops, super-hole digging lollipops ...you get the idea. And Herbie himself could do lots of amazing things. For example, he could fly, he could talk to animals, he could perform an endless variety of magic tricks. He could make himself invisible, or turn himself into a wraith. He could catch bullets with his teeth, or just let them bounce off him like Superman. There are some obvious reasons why Herbie was so popular. While every boy hoped they'd grow up into another James Bond, it was nice to see Herbie around to say that there was a wide range of men that women found attractive. You could argue it was the beginning of geek chic. It made no sense that Herbie would be the most famous person on Earth and yet a schlub to his dad, but of course that was part of the charm. We all thought we were superstars that our family didn't recognize yet as such. Herbie's favorite saying was "You want I should bop you with this here lollipop?" And that was pretty loquacious for Herbie, most of the time he confined himself to terse commands and observations. In the summer of 1960, DC released Superman Annual #1. The significance of this issue cannot be overstated. 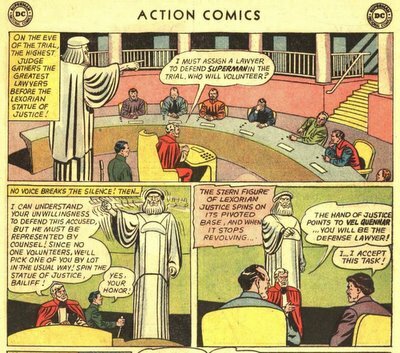 I don't believe that DC had ever reprinted an entire story exactly as it had been previously published (with the arguable exception of the Superman story in Action Comics #1, which had appeared in Superman #1 with panels that had been cut from the original story to make it fit). It must have been successful enough because in the summer of 1961, DC followed up with Batman Annual #1. This is one of the greatest comics ever assembled, a selection of stories brilliantly chosen to introduce the reader to the Batman saga. It's a superb retelling of the origin as a flashback sequence. The rest of the story has Robin teaching Batman (and the reader) about his crimefighting techniques. The next story was Untold Tales of the Bat-Signal from Detective 164, which continues the discussion of Batman's arsenal of crime-fighting equipment, followed by The Origin of the Bat-Cave, a time-traveling tale from Detective #205 where Batman and Robin help out a colonial-era frontiersman who spies on the "savages" in order to learn their plans to attack the settlements. 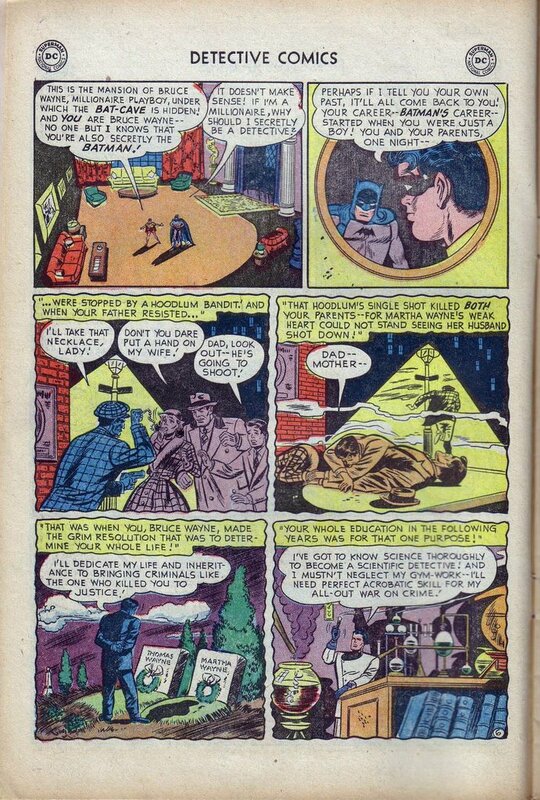 This was followed by Batman's Electronic Crime-File (original title The 10,000 Secrets of Batman), an early example of a simple computer database in action (actually a card sorter). Because he has no super powers, Batman has always been at the forefront of innovation in crime-fighting tools. Rounding out the book are two more tales showing off different aspects of Batman and Robin. Thrilling Escapes of Batman and Robin and The Amazing Inventions of Batman show the dynamic duo in action. 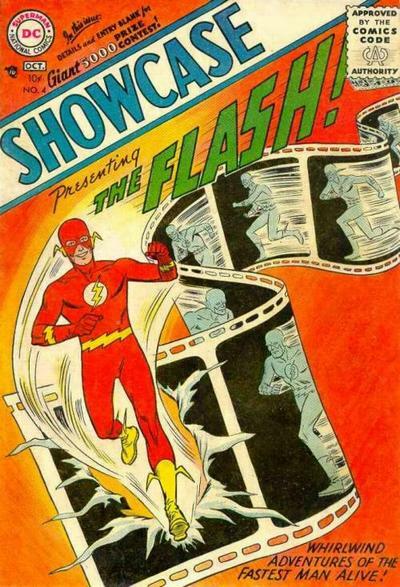 Showcase was probably the most important DC magazine of the late 1950s and early 1960s. It was intended to showcase new comic characters to see if teenage boys would buy them before launching a new book. The Flash had been a Golden Age character, but this was the new Flash. 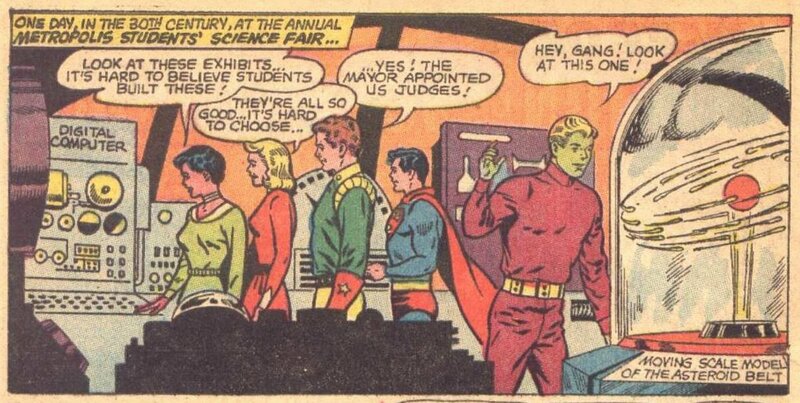 Where Jay Garrick had been a research scientist with his own laboratory, Barry Allen was a police scientist. Barry wore a face-covering mask, while Jay had simply worn a helmet and vibrated a bit so his features were blurred. After Showcase #5, featuring Manhunters, Showcase went on a remarkable run. Starting with #6's Challengers of the Unknown, every feature published in Showcase up until #40 graduated to either its own magazine or (in the cases of Adam Strange and Space Ranger), became cover features in other DC magazines. In rapid order, the DC cover stars of the 1960s appeared: Flash, Challengers of the Unknown, Lois Lane, Space Ranger, Adam Strange, Rip Hunter Time Master, Green Lantern, Sea Devils, Aquaman, Atom and Metal Men. 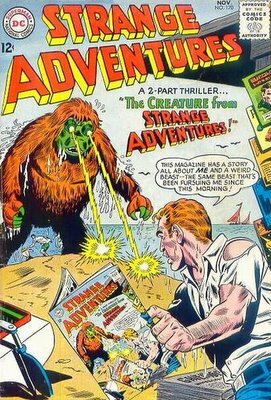 Flash lasted for 246 issues, Challengers for about 80, Lois Lane for about 130, Rip Hunter for 30, Green Lantern for 90, Sea Devils 35, Aquaman 56, Atom 45 and Metal Men 45. After that, either DC's ideas began to run out, or Marvel began cutting into the sales, or (my opinion), DC stopped trying to create new superhero titles. From 41-54, none of the features were deemed worthy of continuing. Tommy Tomorrow (a DC sci-fi hero since the 1940s) was given the big treatment in 41, 42, 44, 46 and 47. Issue #43 was a one-shot Dr No (had DC gotten rights to the movie without real rights to James Bond?). #45 featured Sergeant Rock, who of course was already a cover feature in Our Army at War. Issues #48, 49 and 52 featured Cave Carson, a spelunker who mostly battled weird monsters inside earth and who had already a pair of tryout trilogies in Brave & Bold.